A wonderful couple, who didn't know they were expecting, soon found themselves with the arrival of a bouncing baby boy! CONGRATULATIONS TO JUDY AND HARVEY! Zen Nikita at 10 years old..just a baby boy at heart, found himself needing to find a home. His father was moving to Arizona and couldn't take Zen on the journey. Little did everyone know, but his new home was soon to be found. Harvey and Judy had joined Tails of the Tundra wanting to help in memory of their loved Sebastian. They decided that fostering was the route to take and Zen was the ideal candidate. It didn't take long ... maybe a second ... to realize that Zen was home. Thank you Judy and Harvey for opening your hearts and home to Zen. We know that you will take good care of him and love him as a son. And thank you to Jamie for working hard to help find Zen a good home. 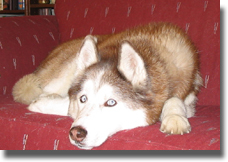 After 4 loving years with Harvey and Judy, Zen crossed over to the Rainbow Bridge on February 16, 2005. 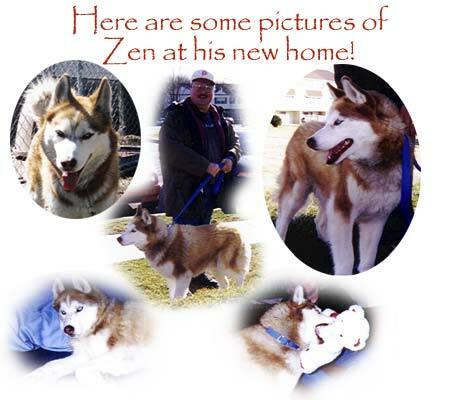 Visit our memorials page to read Zen's memorial.